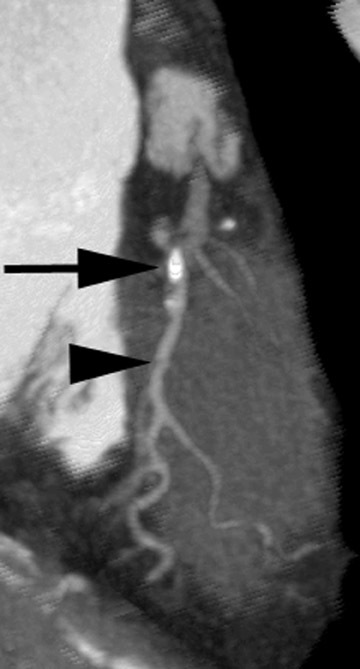 With its superb scan coverage and image resolution, multidetector computed tomography (MDCT) has firmly established its role in noninvasive angiography. Coronary artery imaging pushes even today's advanced technology to its limits, however, and continues to drive research and development. The demands that coronary CT angiography (CTA) places on multidetector-row technology in terms of contrast resolution, spatial resolution (approximately 1-mm isotropic voxels), and temporal resolution (approximately 100 msec) far exceed those of other applications. In addition, apart from peripheral vascular imaging, coronary CTA is perhaps the only application for which three-dimensional (3D) imaging is mandatory at this time. 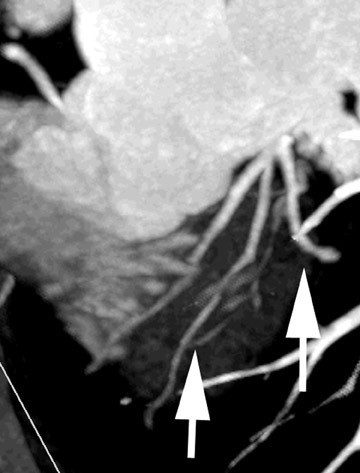 This article will review acquisition parameters for MDCT of the coronary arteries, techniques for contrast administration, the role of dual-head injection, image postprocessing, and current clinical applications. Table 1 describes a typical multidetector coronary CTA protocol. Collimation is as narrow as possible (0.675 mm or 0.75 mm, depending on the scanner). The effective slice width is ≤1 mm, and the reconstruction interval is 0.6 mm. The table speed is slow, 2.8 mm per rotation, to enable the oversampling that is required for coronary CTA. The gantry rotation is very fast, 0.42 seconds. Segmental reconstruction is used to achieve a temporal resolution of 100 to 200 msec. With an mA of 500 and a kVp of 120, radiation exposure during coronary CTA is relatively high, 42 mGy, or 7 to 10 mSv. The protocol involves retrospective gating, and the scan time is short-15 to 20 seconds. In the past, long scan acquisition times were matched to longer contrast delivery times. Today, scan acquisition times have been halved and the demands for fast contrast delivery and bolus capture are much greater. At the same time, the goals of coronary CTA are changing. Detection of stenosis is only one objective. Other goals include evaluation of the arterial wall, characterization of atherosclerotic plaque, and analysis of cardiac function using cardiac chamber endocardial opacification. After intravenous injection, contrast material travels to the right side of the heart, through the lungs, and into the left side of the heart. It then fiows through the systemic circulation. After the contrast bolus is injected, it increases in length and splits, and portions of the bolus remain in the right side of the heart. Another challenge is the "dead space" of contrast in arm veins, the upper thorax, and even the contrast injector tubing-perhaps a total of 20 to 30 mL. The final intensity of contrast enhancement depends on many factors. These are related to patient characteristics (body size; circulation, including cardiac output and circulating volume; and renal function), contrast (volume, injection rate, iodine concentration, and whether a saline chaser is used), and technique (access and route of administration, scan delay, scan speed, and injection pattern). Only a few of these factors are of practical importance in infiuencing routine coronary CTA. This is largely a first-pass technique that does not depend on the fiow of contrast through the systemic circulation. At the scanner, there is no way to predict reliably or to quantify the effect of cardiac function and other patient factors on the contrast peak in the left ventricle. Similarly, contrast factors (such as concentration, osmolality, and ionicity) remain largely consistent in routine practice. The injection technique is individualized to the study, however, including the timing of the contrast injection, the timing of image acquisition, and, perhaps, the mode of injection. 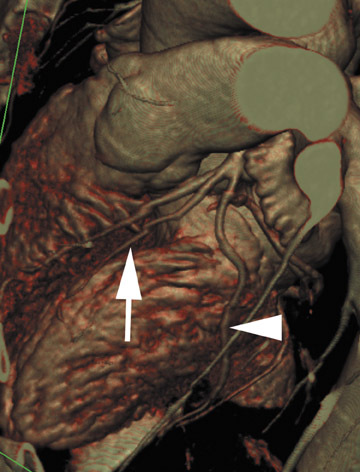 In coronary CTA, a large enough volume of contrast material must be administered at a sufficiently high rate to reach and maintain a homogenously high concentration throughout a 15-second data acquisition, while covering z-axis scan distance of 20 cm (the left ventricle and outfiow tract). 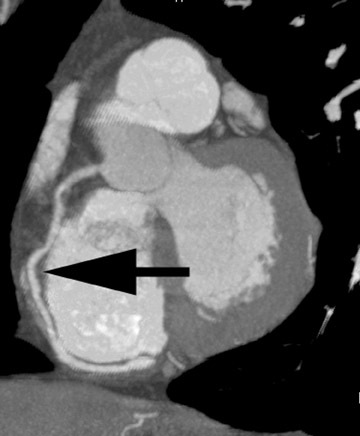 At the time of image acquisition, the greatest contrast enhancement (200 to 300 HU) should be in the region of the left ventricle, the ascending aorta, and, therefore, the coronary arteries (Figure 1). It is important that contrast density values are sufficient to facilitate the segmentation techniques used in multidimensional postprocessing. The contrast material used in coronary CTA generally has an iodine concentration of 300 to 350 mg/mL. Most institutions use a low-osmo-lar, nonionic contrast agent, although some use an isosmolar preparation, particularly in select groups of patients at high risk for nephrotoxicity. Given the limitations of mechanical CT, it is preferable to keep the patient's heart rate as close to 60 bpm as possible. The use of beta blockers to achieve this goal will have the effect of increasing peak maximum enhancement by 10% and increasing time to peak maximum enhancement by 4 seconds. This effect may be offset, in part, by the positive chronotropic effects of contrast media. Timing is critical in coronary CTA, which necessitates synchronization of data acquisition with both the electrocardiographic (ECG) tracing and contrast delivery. Images are acquired throughout systole and diastole, and the ECG is used to guide retrospective reconstruction. Coronary artery enhancement is characterized by a rapid rise to a peak enhancement of fairly short duration, followed by a rapid fall-off (Figure 2). The optimal scan delay to coincide with peak enhancement can be determined through use of a test contrast bolus, a tracking bolus, or empiric observation. The first two techniques have their advocates, but studies examining their success in achieving a more consistent and reproducible level of contrast enhancement have reported variable results. 1-4 They do, however, add another step in the protocol, and there are, as yet, no studies of their particular application in coronary artery imaging. At our institution, we administer approximately 100 mL of nonionic, isosmolar contrast material with an iodine concentration of 320 mg I/mL. We inject at a constant unimodal rate of 3.5 to 4 mL/sec. Recently, we have been experimenting with the use of a 25-mL saline chaser delivered through a dual-head injector. We use an empiric scan delay of 25 to 28 seconds. Figure 3 illustrates the consequences of poor bolus geometry and a less than optimal scan delay. In this case, contrast material has not yet reached the aorta; instead, it is primarily in the pulmonary artery. The ability to visualize coronary vessels is limited, as is the ability to visualize the lumen and arterial plaque. Beam hardening artifact in the superior vena cava (SVC) can also reduce visualization (Figure 4). The need to overcome this problem has spurred interest in dual-head injection, whereby contrast injection is followed by a saline chaser. Two methods of administering the saline chaser have been reported. 5,6 The layering technique involves partially filling the injector syringe with contrast material, followed by a layer of water. Upon inversion of the syringe, differences in specific gravity cause the water to move to the top of the syringe and the contrast material to the bottom. Therefore, a single injection will deliver both contrast material and a saline chaser. An alternative method is to invest in a dedicated dual-head injector with two separate syringes, one for contrast material and one for saline. After delivering contrast, the injector automatically releases the saline chaser. There is no method to incorporate the saline chaser into pretest timing techniques; however, optimal scan timing is probably dictated more by the delivery of contrast itself. The theoretical advantage of using a saline chaser is the opportunity it presents to recapture a part of the contrast bolus that otherwise would be wasted in the venous dead space. By increasing the circulating volume of contrast, the saline chaser may increase peak enhancement in the left heart, but there are as yet no convincing data supporting this possibility. To date, experience with the saline chaser has been mixed. At our institution, the saline chaser has not consistently improved left-heart opacification. It is not clear that applying a constant 20-mL saline chaser to a technique that contains many unquantifiable variables (including the heart function and pulmonary circulation) will produce a more consistent outcome in opacification. In addition, not everyone finds beam hardening of the SVC to be a substantial problem. Although the right coronary artery courses along the atri-al-ventricular groove, beam hardening most often occurs in the dependent portion of the right atrium, away from the atrial-ventricular groove. Even with excellent contrast delivery and image acquisition techniques, certain challenges must be overcome during postprocessing. Layering artifact, for example, is often observed in images created through multiplanar postprocessing and, to some extent, volume rendering. This artifact, which appears as lines running through the image of the heart, refiects the cobbling together of retrospectively selected images from different cardiac cycles and from different points in a single cardiac cycle. By definition, each block of data represents a different time point in the geometry of the contrast bolus. Layering artifact can be differentiated from motion artifact by looking closely at the edges of the vessels and observing no stepoff. Opacification of the coronary arteries creates another challenge. The better the opacification, the more difficult it is to differentiate the vessel lumen from calcification or stents during postprocessing (Figure 5). This problem can be overcome through the use of a maximum-intensity projection (MIP) and bone windows. The primary clinical application of coronary CTA is the examination of native coronary vessels (Figure 6). This includes evaluation of an aberrant coronary artery origin or course, detection and measurement of stenosis, plaque characterization, and evaluation of stent patency. Coronary CTA readily detects stenosis and obstruction and, therefore, has a high negative predictive value (>90%) for significant coronary artery disease. It is often used in patients with a low pretest probability of disease, although more complex patients are now referred for coronary CTA as well. It is also useful for the evaluation of bypass grafts. Cardiac functional analysis is of growing importance, and useful information is contained within the acquired CTA data set. This application requires good opacification of the ventricle, rather than the coronary arteries. The goal is to define the endocardial surface, which enables calculation of wall thickness and chamber volumes in systole and diastole and, therefore, functional indicators, such as ejection fraction (Figure 7). We supply this information to the referring physician, along with digital or print images and, occasionally, video demonstrating functional changes throughout the cardiac cycle. Optimal coronary CTA requires synchronization of contrast administration and data acquisition. In the future, much greater rigor will be required for this task to improve test reproducibility and intra- and inter-patient consistency. Improvements will likely include the development of an index of normal and abnormal contrast circulation times, the ability during bolus tracking to sample at multiple sites (rather than a single point), and calcification subtraction techniques. Advances in scanner technology, including an increase in the number of detectors, will increase scan speed and reduce contrast volumes, but may also increase the chance of contrast timing error. U. JOSEPH SCHOEPF, MD: Can you give us an idea of the scope of a daily clinical routine to use cardiac imaging these days in your institution? What tests are being requested by the referring physician? What do you do? Where do you feel that you are on the safe side in making a definitive diagnosis? What are the tests that you are actually getting reimbursed for? LEO P. LAWLER, MD, FRCR: In terms of what we are doing, I think I would divide it into three categories. The first category is those areas in which coronary CTA is clearly superior to coronary angiography. We are finding that the aberrant origin question is clearly an area in which we find a great demand, application utility, and great acceptance. Clearly, that is not a very common condition; however, it is a common question. When they do not have confidence they are seeing the vessels very well, that has become a question for us. The next area is the established areas of coronary angiography, and we are making inroads in that. We are finding that physicians are referring those patients in whom they have a low pretest probability and they are really working on our high negative predictive value. We are also starting to get the more difficult cases, and I illustrated some of those, such as the vessels that are not particularly normal, and the patients who had a high enough pretest probability. We are starting to see that now and I think that the word on the street is that there is clear interest among the cardiology community to find earlier disease, to find nonstenotic plaque, and to start applying the stents that elute pharmacologic agents. The other area is new techniques where we are not just trying to reinvent the wheel and do coronary angiography. We are trying to sell a package to people in which we will give them the angiography information, but we will give them an awful lot more. Of course, we have bias just because of our institution, but the whole area of mapping of the wall of the heart and its functional changes throughout systole and diastole is very important to a lot of people. 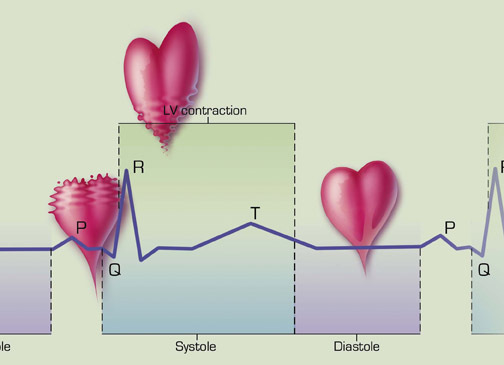 This refiects a new perspective of cardiac function in which people are saying that the geometry of the heart is the issue and restoring geometry with a particular reconstruction is better--that is the big issue for people. So those are the three biggest areas for us. In terms of reimbursement issues, it does not have a code at this point in time. Basically, we do what others are doing; either we do them under a research protocol, together with our cardiology and surgical colleagues. Or, others have been attempting to apply other thoracic angiography codes to a cardiac CT study as well. I think these are the ways forward. We do not yet have the weight of data yet to be able to get it reimbursed as a separate study. W. DENNIS FOLEY, MD: Most people who are illustrating cardiac CT and coronary artery CT do not put much emphasis on the diagonal branches or the other branch vessels in the coronary arteries. Do you have experience with that in terms of your ability to visualize those vessels and see stenoses? LAWLER: That is a very good question and I actually just started looking at that. I started looking at it more because there is an American Heart Association publication for angiographers that addresses what they demand of a study and so forth. There is no question; we have to not only do what they do, but perhaps even do it better to some extent. Simply saying that the main vessels are opacified is not enough. You need to see the diagonals, and so forth. Looking at individual cases, I have found in patients with moderate stenosis or fairly normal vessels that you can consistently see diagonals, you can see marginals, and you can even see small septal branches. You can say whether they are open or not, but you cannot give greater detail than that. I think 2-mm vessel size is our limit right now. Maybe the higher resolution will change that. I am not sure, but maybe it will. The other thing one must bear in mind is that we often assume that the gold standard of coronary angiography, like a lot of gold standards, is not really a gold standard. I mean, it certainly was the standard of care. But if you look at it, the reports and the way they quantify disease are fairly binary. I think most of the AHA guidelines on what they consider a good report include that you say it is >50% or >70% stenosis. It does not come down to saying it is exactly a 63% stenosis. I do think we are able to say that it is >50%, perhaps, but I do not think we can give those specific numbers yet. But I also think that we will probably get better absolute numbers ultimately than coronary angiography probably will be able to, because we give the wall information as well. FOLEY: Some authorities have stated that if a coronary calcium score is high, they will not do intravenous coronary angiog-raphy. Do you have any comments? LAWLER: That is another very good point because it is a very practical point. What we have done, and what a number of people have said, is that maybe these patients should all have a calcium score as part of their workup, though obviously it has radiation implications. But it may obviate the need for CTA, which is a very high-dose technique. It is much higher than conventional angiography. In my opinion, if the person has a very high calcification burden, I am very reluctant to perform coronary angiography because I do not believe I can tell them the type of information they want in a comprehensive study. However, if they say that they do not care about the smaller vessels and they simply want to know does he have a "widow-maker" lesion, a left main lesion, or a right coronary lesion, etc.--we are superb at that. We can do that even if there is a lot of calcification because it is still possible to image those rather large origins and we can still give the information, such as opacification of the vessels, the dominance of the systems, etc. But as a simple answer, I think if there is a heavy burden of calcification, it is possibly not prudent or in the patient's best interest to do that test; they will most likely need a test of greater specificity and sensitivity. SCHOEPF: I am curious about your opinion on the role of 3D postprocessing in the evaluation of CT coronary angiography. There are reports that with use of 3D there is a greater sensitivity for the detection of lesions that can be achieved with the individual sections plus some dedicated MIP of the individual coronary arteries alone. I believe that one of the reasons why this has not taken off in the community so far is simply because the evaluation of those data sets is so cumbersome. That deters some of the cardiologists or radiologists in private practice who are trying to do that. Is 3D visualization or 3D postprocessing going to make it a lot easier? If so, to what degree? LAWLER: I do think it is very important; in fact, I think it is simply mandatory to do 3D. You simply cannot do coronary angiography just looking at axial images, and you cannot do it looking at multiplanar images. So you have got to do 3D. That is just a given. There is no doubt, in my opinion at least, that in doing the 3D processing that the MIPs are the best in terms of stenosis evaluation. The volume-rendered image is better for the characterization of disease looking at plaque, and so forth. It is better for the relative changes along the course of the vessels, and they certainly seem to be the images that the referring doctors like for the record. But for quantification and really giving the kind of detail a lot of people want, it really needs to be MIP. Together with that, there has to be greater automated segmentation. Most radiologists in practice, particularly in busy private or academic practices, want to do coronary angiography. Therefore, by definition, they want to do more work. This is a case in which you have to be careful what you wish for, because if you do it well and it takes off, you will be doing a lot of cases. It is a very prevalent disease, of course. You have to accept at the outset that if you are going to do that, that it will require more time and to do it you are going to have to invest in it. You cannot simply do it as a thoracic aortic examination and just add it on. It is going to require more time. But, as was shown at RSNA this year, all the vendors seem to be moving toward having systems where you really have minimal segmentation. You just go straight to the vessels you want to look at. You are getting rid of the whole chest wall, even getting rid of the heart in some of the software programs. That clearly has to happen, because it is very labor-intensive. BRIAN R. HERTS, MD: How long does it take to read one of these studies? LAWLER: I think to do it well, just to the coronaries, it takes at least 30 minutes. For this, I am just talking about reviewing the vessels, and it takes a good 30 minutes. You have to go between the axials, then go to the MIPs. You have to check the volume rendering sometimes. You have to have an interface where you can go do that fairly quickly, double check, triple check, and go back and forth, going from the most faithful to the original data, which is obviously the cleaner data. Then maybe you have to go back to the MIPs to get an overall sense of stenosis and then prove you are right. You must be sure you are not getting some false-positive readings because of thresholding or something by checking some of the other techniques. I would say it takes a good 30 minutes to do that and the report. A diligent report takes at least 10 minutes to do. If you really want to do it well and go through left main and so on, it takes a lot of time. GEOFFREY D. RUBIN, MD: Do you use beta-blockers in any of your patients? LAWLER: We try to, yes. It depends on the patient population again, but generally, we want the heart rate at approximately 60 bpm. RUBIN: So you are using oral beta-blockers? How effective are they? LAWLER: Yes, oral beta-blockers. They are reasonably effective. Often, we do not know how fast the heart rate was before we saw the patient, so I am not sure how much it really diminished the heart rate. RUBIN: You were routinely giving beta-blockers before patients came in, regardless of their heart rate? LAWLER: Right. Everyone will have to figure out their own procedures locally, of course. We set up our plans with one of our referring doctors who actually is a cardiologist. When he orders the study, he writes the prescription for the beta-blocker and gives an oral beta-blocker ahead of time. He is also willing to come on site and give an intramuscular injection, if necessary. But I think that beta-blockers are still required because most of us do not have a heart rate that is suitable for mechanical multidetectors. RUBIN: What is your dose? LAWLER: The standard dose they give is 20 mg of labetalol. RUBIN: If a patient comes in with a heart rate of 80 bpm, do you cancel the scan? LAWLER: I would personally cancel it because I think it is worse to go ahead with a heart rate like that. Because again, if all they want, for example, is to know about the left main artery, you can just do a simple CT for that. You do not even need a coronary CTA; you can just do an ordinary aorta protocol. If they truly want a coronary CTA and the patient comes in with a heart rate of 80 bpm, you are not going to get an interpretable study. The radiation dose ≥7 mSV is just not justified. RUBIN: Do you think the heart rate restrictions are the same for bypass grafts? LAWLER: Probably not, because they are relatively motionless. In fact, in certain cases, I find that the left coronary arteries are fairly forgiving, even though the left circumfiex is in the AV groove. It is the right coronary that will hurt you every time and, obviously, a lot of people are right dominant. Let me just add to that, that the patient population is very important. A lot of the literature is saying right now that we should be using this in people who have relatively lower pretest probability. If they come in with acute chest pain, you probably should not be doing CTA in the first place because they may need intervention at the same time. RUBIN: Do you scan patients with atrial fibrillation? LAWLER: We have, and we have gotten away with it on a few cases. Again, arrhythmias are a big problem with any kind of retrospective gating, as you know. The editing tool of the EKG can save the study to some extent. But if it is a case in which your data acquisition for the two R waves got beat all over the place, when you try to do too much editing you will actually lose so much data the images are very poor. So to summarize, cases of arrhythmia, fast heart rate, and a heavy burden of calcification are those in which we are not ready for CTA. These areas show that we are not there yet and we have to be more selective and have close attention to protocols. RUBIN: One question concerns MR. You specifically referred to your third tier of CT applications as being functional. Sometimes I wonder if we may push what we try to squeeze out of the data a little too far because of the recognition that our temporal resolution for aspects such as wall motion and relative wall motion does not even come close to the capabilities of what we can do with MR.
RUBIN: So I wonder if you think that it is wise to engage upon a clinical cardiac imaging program that does not somehow integrate the benefits of MR and CT. Do you think that we can use CT to fully characterize ventricular function, for example, or even looking at myocardial ischemia and the issues of hibernating myocardium versus truly infarcted myocardium? Can you comment upon the relative roles of MR and CT? LAWLER: I can give you my own intuition and what I think of the literature. I think you are absolutely right. Most people are saying right now to use CT for the coronary angiography and use MR for the perfusion data and certainly perhaps some of the other functional data. I generally agree with that. Although you may have also seen in the February 2004 issue of Radiology that they published a study of a functional analysis looking at CT functional imaging compared with MR.* The numbers for CT are very good in terms of ejection fractions and so forth. I think that if that is the case, and you are exposing these people to a fair dose of radiation, if it turns out that the ejection fraction measurements and the wall-thinning and the wall-thickness changes are reasonably good, it does strengthen the role of CT. If people still want to know perfusion imaging, that is clearly another question, and I cannot see how CT is ever going to do that. But I think the best way forward for a private practice or an academic institution to do this and to do it well is to form a single cardiovascular unit that uses all the MR data, CT data, SPECT data, and, perhaps, PET/CT data. That is the only way to harness all of our individual potentials and fully realize the anatomic and functional imaging that will, no doubt, be the standard of care for the future. There is no doubt about that. *Juergens KU, Grude M, Maintz D, et al. Multi-detector row CT of left ventricular function with dedicated analysis software versus MR imaging: Initial experience. Radiology. 2004;230:403-410. Coronary CT angiography. Appl Radiol.